Note: We wrote this recipe for a book that we co-authored years ago called the Bride and Groom First and Forever Cookbook. 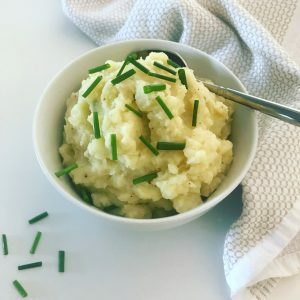 We reserve this rich and decadent version of mashers for the holidays and for special occasions as it is a “full monty” version. (The kids and hubbs would be VERY fussy with us if we tampered with this rich and decadent version. ) Sara and I lean towards dairy-free living these days so stay tuned for a “Creamy, Creamless” Mashed Potato recipe soon. In the meantime, for a dairy-free rendition, simply substitute the cream and milk for a nutmilk or coconut milk and the cheese for a dairy free cheese of choice. A few tips: Mom taught us early on that a hint of onion juice transforms ordinary mashed potatoes into an unforgettably delicious offering. Another secret is the easy-to-handle, inexpensive potato ricer, which yields restaurant quality mashers in minutes due to the impeccable texture that this simple gizmo imparts…. not gluey, not lumpy, but perfectly soft and smooth. Don’t sweat it if you don’t have a ricer though. We love to smash the potatoes with a hand masher as well. Put the potatoes in a large saucepan and cover with cold salted water. (We use 2 teaspoons kosher salt per quart of water.) Bring just to a boil over high heat. Reduce the heat to low, and simmer until the potatoes are tender when pierced with a fork, about 20 minutes. Drain the potatoes. Meanwhile, heat the cream, butter, and the 1/4 cup milk in a small saucepan over medium heat. While the potatoes are still hot, press them through a potato ricer. Alternatively, mash with a potato masher or a large fork. Return the potatoes to the large saucepan and fold in the warm cream mixture, then the cheese and the grated onion. Season with kosher salt and pepper and more onion to taste, thinning with additional milk to the desired consistency. Note: Using the finest grate on a handheld grater, grate the onion into a bowl. You can also put small pieces of onion through a garlic press. Sometimes the result will be onion juice and other times, it will have the consistency of onion purée. Either is suitable for this dish. The purée is a little stronger, so add with caution.